The World Small Animal Veterinary Association (WSAVA) regularly publishes guidelines for the vaccination of Dogs and Cats. Their website can be found at http://www.wsava.org/guidelines/vaccination-guidelines and it also contains a wealth of information on kidney, liver and hereditary diseases. The Great Dane Breed Council held its autumn meeting on Monday 26th September 2016 at the Holiday Inn Stafford and was attended by delegates from seven of the eight participating clubs. The meeting was chaired by Tony Pearce. Breed Health Co-ordinator Maria McGuinness gave an update on the DCM Research Project and shared the excellent news that the re-application to the KC Charitable Trust for funding which had been made by Liverpool University in conjunction with the Breed Council, has been successful and the sum of £42,000 has been granted. As already agreed another Breed Council Health Day will be held in the autumn 2017. Clubs and their members are asked that any subjects considered suitable for discussion should be brought to the attention of Maria McGuinness. Further details will be available in due course. The BC Health Sub-Committee also gave details of the launch by the Kennel Club Genetics Centre at the Animal Health Trust of the “Give a Dog a Genome” project. Great Danes are included in the initial 50 breeds that signed up to the Give a Dog a Genome project. Tony Schaanning-Ling gave the KCLC report of the last meeting held in May. He advised that he was to continue as Chairman of the KCLC for a further three years. Other subjects covered were a proposed inclusion in Club Show Schedules and Catalogues of the KC Code of Conduct in relation to Social Media; Judging lists and Criteria and the feasibility of producing a video/film on our breed standard for the KC Academy as part of the education of up and coming judges. 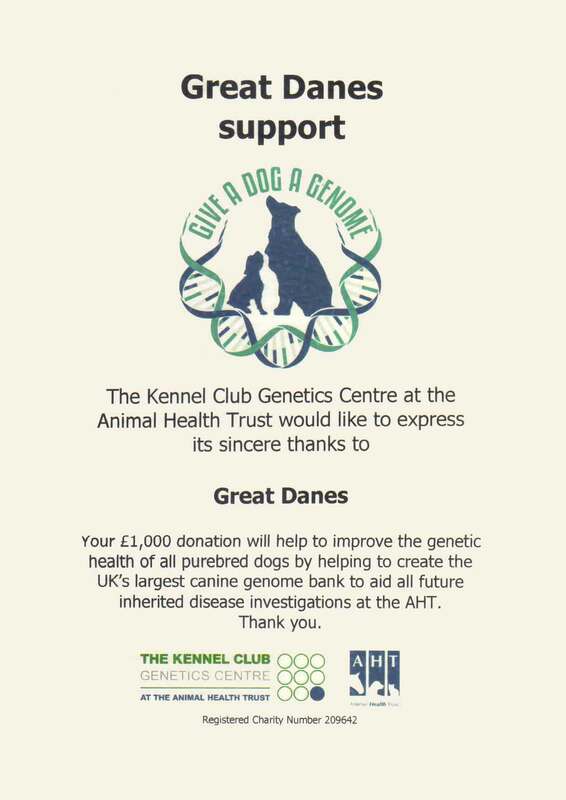 On the 25th January the Kennel Club Genetics Centre at the Animal Health Trust launched the “Give a Dog a Genome” project and we are pleased to announce that our application to be included has been accepted. The £1000 donation for each breed is being matched by the Kennel Club. All nine Breed Clubs are fully supporting this research to create the UK’s largest Genome bank. This will be of considerable help in the understanding of the canine genome and improve canine health. We have received the following from Trish Neill of the Great Dane Lovers Association of Western Australia about a health and lifestyle survey she has carried out and published in July 2015. “We conducted a broad spectrum health & lifestyle prevalence survey on 1,165 pure bred Great Danes in Australia. The population has already contributed to a number of clinical studies including one being carried out in the UK on Osteosarcoma. I am very excited that we now have the opportunity to contribute to some breed specific projects in Australia around key issues. As these commence we will be sharing more information. It is early days as we have only just met with the key scientist”.